This National Trust Ickworth Summerhouse has been installed in our customer’s pretty cottage garden in Merston, West Sussex. They chose a summerhouse from the National Trust range because of its traditional styling, which will perfectly suit the customer’s country style country, and they liked the Ickworth above all other designs in the range because of the roof overhang, giving the look of a beach hut. 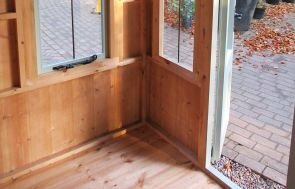 The summerhouse will become a haven for the customer and his wife to read, relax, paint and entertain in through the summer months, and at 3.0 x 2.4m in size (the largest size Ickworth that we make), they will have plenty of room inside to set it up as they wish and make it comfortable. Corrugated sheeting has been used to offer protection for the roof, the external cladding has been made with roughly cut vertical boards (instead of our standard horizontal cladding) to give more of an antiquated feel, and the door and window furniture is made from cast iron in the Fleur-de-Leys style. Leaded windows have also been used, and the window on each side can be opened for ventilation in the heat of the summer. The colour, Painters Grey, has been used on the summerhouse, which is from our National Trust paint range. There are six colours in total to choose from, all of which are natural in tone to help the buildings blend in with our customers’ gardens. If you would like more information on the National Trust range of sheds and summerhouses, you can use our Online Garden Building Planner Tool to create your own, you can send us an online enquiry, or you can call us on 01760 444229 and we’ll be able to talk to you about your building requirements.